In November 2014, a network of optical telescopes picked up a bright outburst from a galaxy about 290 million light years from Earth. Scientists determined that this was a so-called tidal disruption event, where a star wandered too close to a black hole and was ripped apart by immense gravitational forces. Astronomers used other telescopes including a flotilla of high-energy telescopes in space — NASA's Chandra X-ray Observatory, ESA's XMM-Newton and NASA's Neil Gehrels Swift observatory — to study the X-rays emitted as the remains of a star swirled toward the black hole at the center of the galaxy. Some of the remains of the star are pulled into a disk where they circle the black hole before passing over the "event horizon," the boundary beyond which nothing, including light, can escape. The tidal disruption in ASASSN-14li allowed astronomers to estimate the spin rate of the black hole. A black hole has two fundamental properties: mass and spin. While it has been relatively easy for astronomers to determine the mass of black holes, it has been much more difficult to get accurate measurements of their spins. This debris from the shredded star gave astronomers an avenue to directly estimate the black hole's spin in ASASSN-14li. They found that the event horizon around this black hole is about 300 times the diameter of the Earth, yet rotates once every two minutes (compared to the 24 hours it takes to complete one rotation). 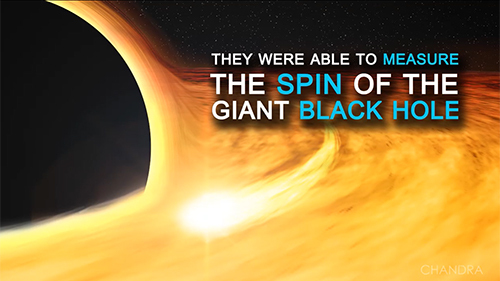 This means that the black hole is spinning at least about half as fast as the speed of light. 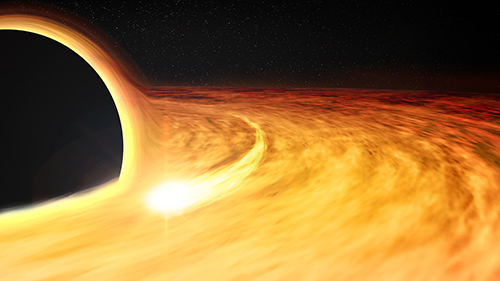 In a galaxy about 290 million light years from Earth, a star wandered too close to a black hole. The immense gravitational forces of the black hole shredded the star, sending the stellar remains into orbit around it. Scientists used several telescopes including NASA's Chandra X-ray Observatory to study this "tidal disruption" event called ASASSN-14li. They were able to use the data to measure the spin of the giant black hole at the center of the galaxy containing ASASSN-14li. The scientists determined that the black hole in ASASSN-14li is spinning incredibly quickly — about half as fast as the speed of light or faster. Since the spins of black holes have been difficult to measure, this discovery is exciting for astronomers.